And the number of households with no TVs at all grew. 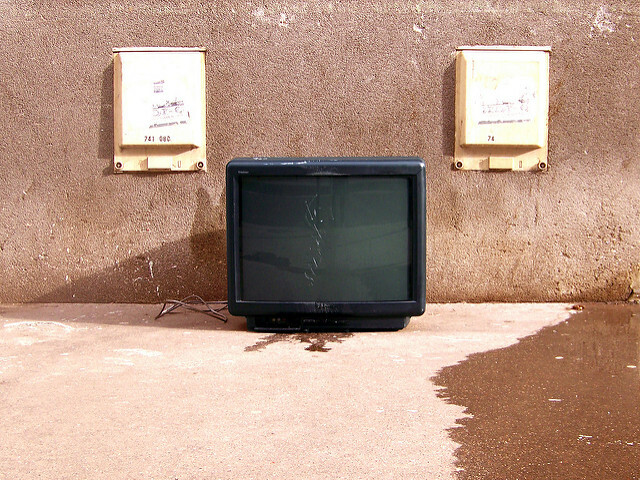 Americans went from having an average of 2.6 TVs per household in 2009 to having 2.3 TVs in 2015, according to survey data from the US Energy Information Agency (EIA). The data comes from the agency’s Residential Energy Consumption Survey (RECS), which has been conducted periodically since the 1970s to understand American energy use. The 2015 survey included 5,600 respondents who were contacted in person and then given an option to follow up by mail or online. A fine-detail report on the survey results is due to be released in April 2017. 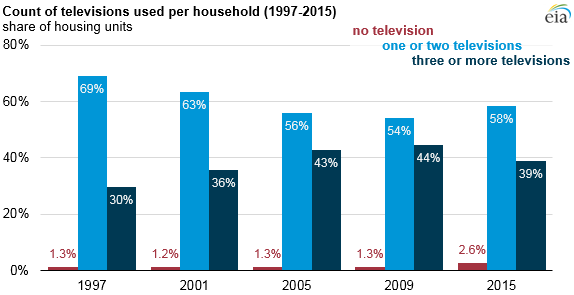 The latest data shows that in 2015, 2.6 percent of households had no TV at all, a jump from the previous four surveys in 2009, 2005, 2001, and 1997 in which a steady 1.2 to 1.3 percent of households didn’t own a TV. The 2015 data also showed that the number of people with three TVs or more dropped in 2015. That year, 39 percent of households had more than three TVs, whereas 44 percent had more than three TVs in 2009. Interestingly, the number of households with one or two TVs increased in 2015 to 58 percent, from 54 percent in 2009. The government surveys TV use because it’s a component of a household’s overall energy consumption. According to the EIA, about 6 percent of all electricity consumption in US homes comes from TVs, cable boxes, DVRs, video game consoles, and other peripheral equipment. As TVs get bigger and higher in resolution, they can demand a lot more electricity, too. Last September, the Natural Resources Defense Council hired a third-party research firm to study TV energy use and found that several TV manufacturers were building their TVs to narrowly pass federal energy use tests, while consuming much more electricity if any of the TVs’ baseline settings were changed.